Post Medieval jetton: Rose and orb jetton of Hans Krauwinckel II and dates from 1586 and 1635. The jetton is a variation of Mitchiner Nos. 1512-1517 as the obverse legend is different, the N is missing from 'KRAVWINCKEL', Obverse: Illegible legend. Three Crowns, alternately with three lis, arranged centrifrugally around a central rose. Reverse: Illegible legend. Imperial orb surmounted by a cross patty, within a tressure with three main arches. 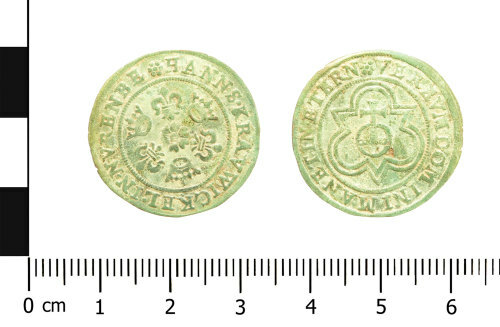 Obverse description: Three Crowns, alternately with three lis, arranged centrifugally around a central rose. Reverse description: Imperial orb surmounted by a cross patty, within a tressure with three main arches.